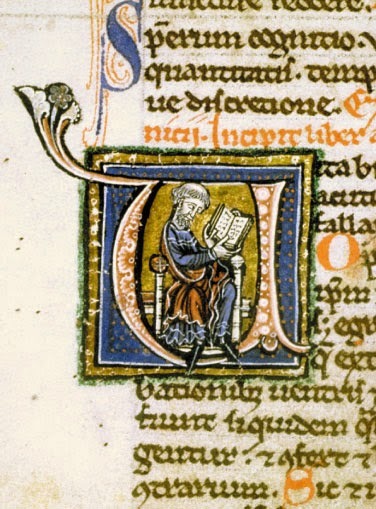 A physician reading. Image: US National Library of Medicine. After expressing all kinds of scepticism in two previous posts (here and here) about Paul Saenger’s arguments concerning word separation, I think it only fair to lay out an aspect of reading with spaces that, according to more recent studies on the neuropsychology of reading, Saenger got (mostly) right. It has been empirically demonstrated that word separation by space does speed up reading for skilled adult readers. Furthermore, it does so in a range of writing systems, including writing systems that use scriptio continua, that is, those that do not conventionally separate words by space, such as Chinese or Thai. In other words, even when skilled readers of such scripts are confronted with unconventionally word-separated text, they process the text more quickly. The Macclesfield Psalter is a manuscript with very unusual marginal illustration. The manuscript was created around 1330 in the region of East Anglia, Britain. It is currently housed in the Fitzwilliam Museum in Cambridge. The absurdity, grotesques, anthropomorphized animals and scatological humour in this manuscript’s marginalia are all as surprising as they are enjoyable. It is an interesting look at what was funny and amusing to the medieval reader of this region. The role of marginal illustration has been identified by scholars as being a mnemonic device, which was especially helpful before pagination was developed. Odd and memorable images, often having nothing to do with the actual text on the page, help one differentiate and remember the location of pages and passages. For your enjoyment, I have compiled my personal top 10 most memorable marginal illustrations from the Macclesfield Psalter. Some of the more rude images were left out of the list, though they are still worth finding and giggling to oneself over…. 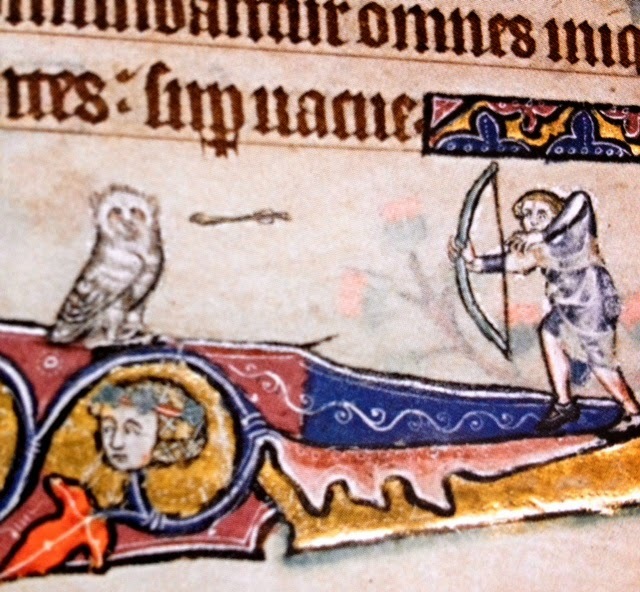 10 – This owl has no idea what’s about to hit him. Or perhaps he does….? This scene seems almost cartoonish. The owl’s expression reminds me of a Warner Brothers cartoon. That moment when Wiley E. Coyote has gone off the cliff, but not fallen, he looks at the audience and gives a knowing look or perhaps a small wave before he falls. Poor owl!